“Danger Zone” is perhaps the best of Archer’s many recurring cultural references. In anticipation of the show’s panel at New York Comic Con this weekend, the reference circle has been made complete with a music video placing the characters in various Top Gun roles. 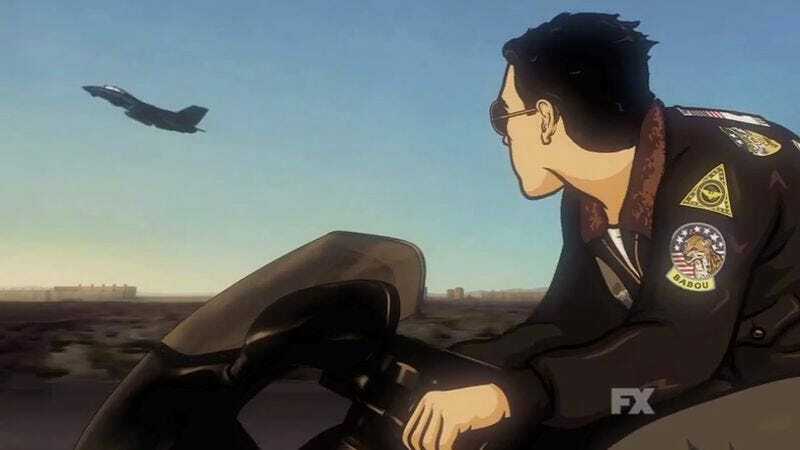 Sterling Archer is obviously Maverick, but with his codename “Duchess” across his helmet instead, Cyril Figgis is Goose (with Pam in the sad Meg Ryan role as his wife), and Lana is Charlie Blackwood. The rest of the cast fills in other roles—Barry as Iceman, Ray as Joker—but the best insert is definitely Krieger as Kenny Loggins, rocking out with a flying-V guitar. And the twist at the end that gets Woodhouse into the video is perfectly in character with Archer’s own fantasies.